The year 2018 has been great in terms of unions and marriages. The beginning of the year saw marriages of many Bollywood celebrities such as Sonam Kapoor, Neha Dhupia while the end of the year saw the wedding of Deepika Padukone and very soon Priyanka Chopra will soon tie the knot with her boyfriend Nick Jonas. 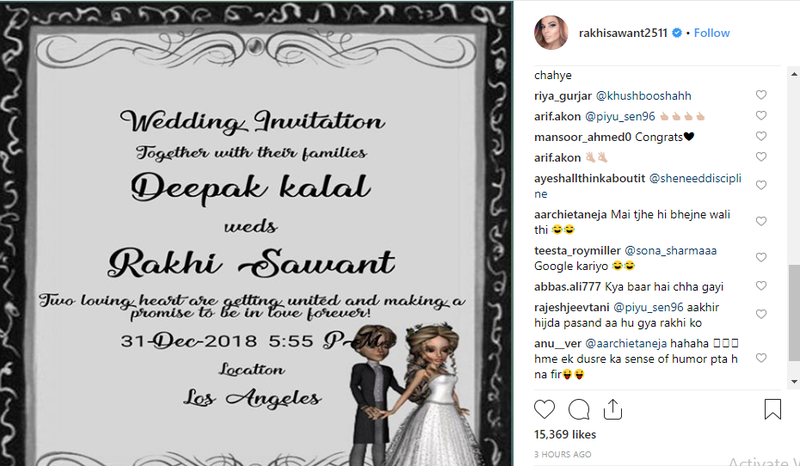 Not only this even comedian Kapil Sharma will soon getting married but hold on, yet another wedding invitation is here and it is of our very favourite controversy queen Rakhi Sawant. 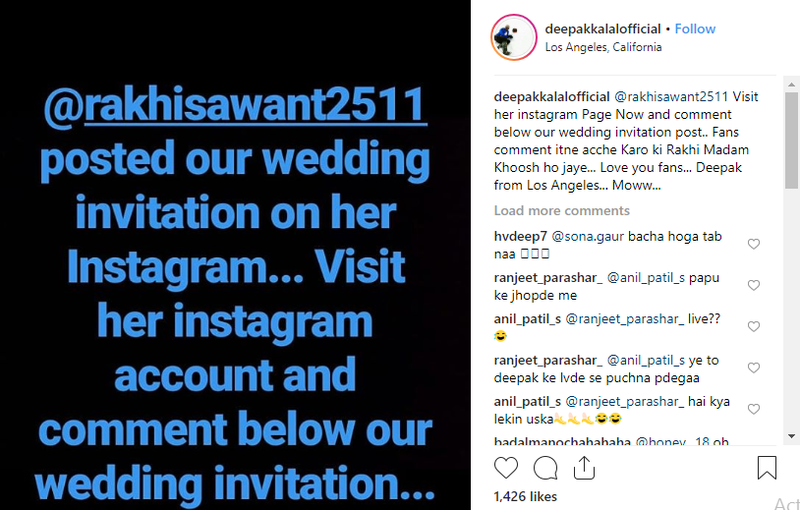 Yes, that’s true, she has herself shared the wedding invitation card on her social media and we bet you will be excited to know with whom she is going to spend the rest of her life with. To end your wait, her ‘dulha’ is none other than Deepak Kalal. The picture of the card has been shared by Rakhi herself on her social media account and it has gone viral within few hours and the talks about the same are already everywhere. Seems exciting, right? Well yet another exciting aspect of this love story is that they both have already visited the doctor to test whether they both are virgin or not and Deepak claimed that the doctor has said that they both are. It is definitely exciting as it is for the first time it came into light that a man too can get his virginity checked. Both Rakhi and Deepak has been controversy creators. A lot of Deepak's video have entertained the audience and have gone viral on the internet. While on the other hand, Rakhi always has an opinion on everything that is happening around the globe. She recently landed on a spat with Tanushree Dutta over the #MeToo scenario. The first time she got into limelight was when singer Mika Singh kissed her forcefully in his birthday party and the video of the same went viral on the internet. It is still a mystery whether their wedding is really happening or it is just another publicity stunt. Stay tuned with us for each and every update on the same.